The crisis in Ukraine has highlighted the importance of Russia’s Black Sea Fleet. I’ve written about the fleet in the past, but it may be worthwhile to provide an update, especially as there have been a couple of surveys of the fleet published in recent days in the Russian press and blogosphere. The fleet currently consists of 40 combat ships, 28 of which are on active duty while the others are undergoing repair or modernization. The average age of these ships is 25, though the largest and most capable ships that are based in Sevastopol are also the oldest. (The average age of Sevastopol-based ships is 32.5) The flagship is the Slava-class cruiser Moskva. Large combat ships also include the Kara-class cruiser Kerch, the Kashin-class destroyer Smetlivyi, and two Krivak class frigates (Pytlivyi and Ladnyi). The Ladnyi is current being overhauled and is scheduled to return to active duty in August. A second Kara-class cruiser, the Ochakov, was decommissioned several years ago and has now been scuttled so as to block the exist of several Ukrainian Navy ships from Lake Donuzlav. These ships comprise the 11th brigade of ASW ships. The 197th brigade of amphibious ships includes six active ships: three Alligator class (Saratov, Orsk, Nikolai Filchenkov) and four Ropucha class (Novocherkassk, Azov, and Yamal), as well as one inactive Ropucha class ship, the Tsesar Kunikov. Together, these two brigades comprise the 30th division of surface ships. Smaller combat ships based in Sevastopol include three Grisha-class corvettes (Suzdalets, Aleksandrovsk, and Muromets) in the 400th ASW ship squadron, four mine warfare ships in the 418th minesweeper squadron, and 4-5 missile boats in the 295th missile boat squadron. There is also the Alrosa Kilo-class submarine. The newest of any of these ships were commissioned in 1990. 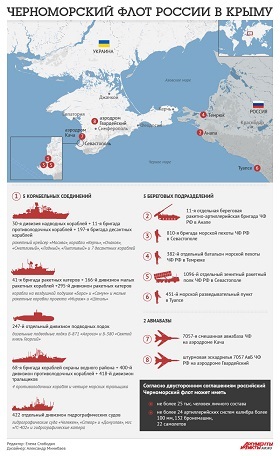 Ships based in Novorossiisk include three Grisha-class corvettes (Kasimov, Eisk, Povorino), two Nanuchka-class missile ships (Mirazh and Shtil), five active and two inactive mine warfare ships, and two hoverborne guided missile corvettes (Bora and Sivuch). These ships are generally newer than the Sevastopol-based ships, with an average age of 22.8. There are also several quite new patrol boats based in Novorossiisk. Over the next few years, the BSF is expected to receive six new Admiral Grigorovich class frigates over the next three years. These are similar to the Talwar class frigates that Russia exported to India a few years ago. It is also expected to receive up to six new improved Kilo class diesel submarines in the same time period. Finally, it may be worth briefly pointing out the Black Sea Fleet’s land and air forces, which include the 11th coastal missile artillery brigade armed with Bastion anti-ship missile systems. These are normally located in Anapa (2 on the map), though there have been some reports that they have been relocated to the Crimea in recent days. The 1096th anti-aircraft missile regiment is located in Sevastopol (5 on the map). Naval infantry forces include the 810th naval infantry brigade based in Sevastopol (3 on the map) and the 382nd independent naval infantry battalion based in Temriuk (4 on the map). The 431st naval reconnaissance post is located in Tuapse, near the border with Abkhazia (6 on the map). Naval aviation forces include facilities at Kacha (7 on the map) and Gvardeiskoe (8 on the map), both Crimea. The former houses (approximately) 20 Ka-27 and Mi-14 helicopters and 10 Mi-8 helicopters, as well as 10 Antonov transport planes of various types and 4 Be-12 amphibious planes. The latter houses 22 Su-24M attack aircraft. This entry was posted in Russian Navy and tagged Black Sea Fleet, Crimea, Ukraine. Bookmark the permalink.